Our paper “Business Model Ideation: An Experimental Approach For The Evaluation Of Team-Based Methods” has been presented at Euram 2012 by Friderike Hoffmann on Friday June 8th. The European Managment Conference took place in Rotterdam (Netherlands) this year. Developing new business model ideas is a complex, ill-defined innovation task and among the core challenges for existing firms aiming to achieve sustainable success. Neither business model nor idea generation research has yet fully examined suitable methods to generate business model innovation ideas. We have conducted a comprehensive literature review and develop a model to examine the effectiveness of different methods for the generation of business model ideas. The model comprises both objective and subjective effectiveness measures. In a first empirical application of the model in an experimental setting, we have compared the effectiveness of the business model innovation canvas, collaborative sketching, and brainstorming to generate novel business model ideas. The initial results suggest that the model is suitable for comparing different methods: it discerns key indicators of effectiveness, important tradeoffs between quantity and quality of ideas, and between satisfaction and the ability to select the best idea. In our previous studies we have shown that knowledge visualization is helpful in facilitating meeting and communicating strategy. Is it so only in Europe? We are now expanding our cross-cultural experiment to India. 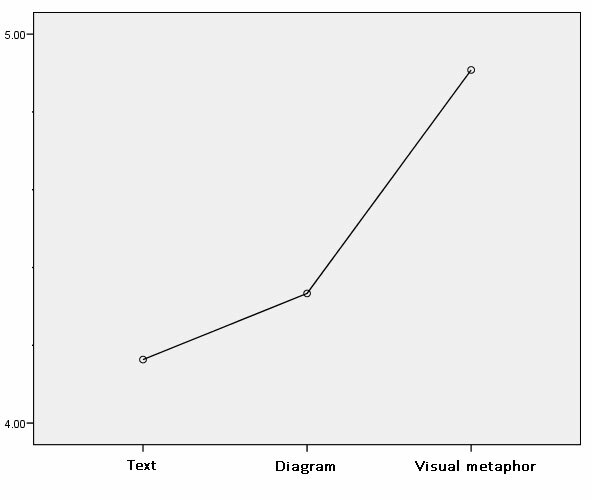 We compare the results of people exposed to a textual or visual content. The results of over 200 subjects in India confirm our previous results, showing that visualizing strategy has a positive effect on behavioral intention. In particular, when people are exposed to a representation of the strategy in the form of a visual metaphor, they like it better and they are more committed to implement it, compared to simple text or a diagrammatic representation. We find the same result pattern all over Asia, while Europeans prefer diagrams. So what? If you communicate your content (as for example strategy) with knowledge visualization instead of text, your audience will probably like the content better and thus to be more committed to it. If you are communicating to Indians you should prefer visual metaphors, rather than bullet-point text or linear diagrams (like a timeline).